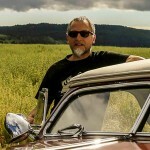 Custom Car photographer Marcia Campbell and Sam Barris were good friends. 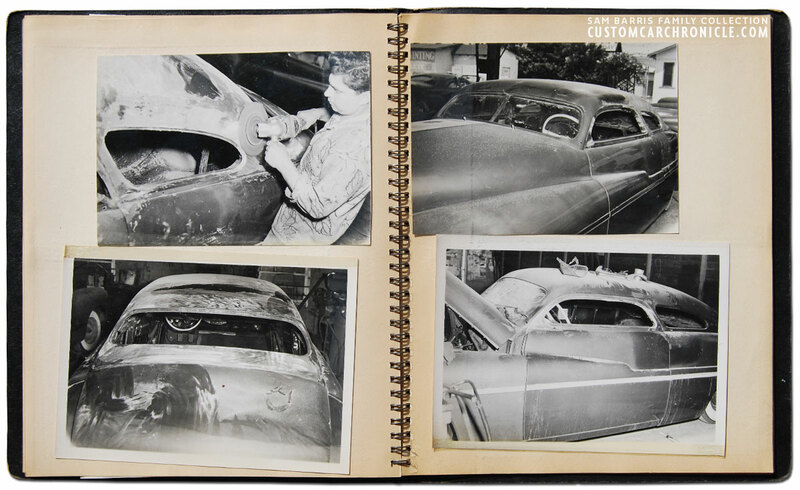 When Sam chopped the top on Jerry Quesnels 1949 Mercury Marcia took a series of step by step photos and used prints from the series for a personal photo album for Sam. In 2009 I worked with John Buck and Alex Idzardi on the Mercury Gathering, a special Custom Car exhibition at the Sacramento Autorama. The whole organization of this event and the event itself was an amazing experience, I met so many amazing people and saw the best of the best Custom Mercury’s. But there was one special object that was the icing on the cake. 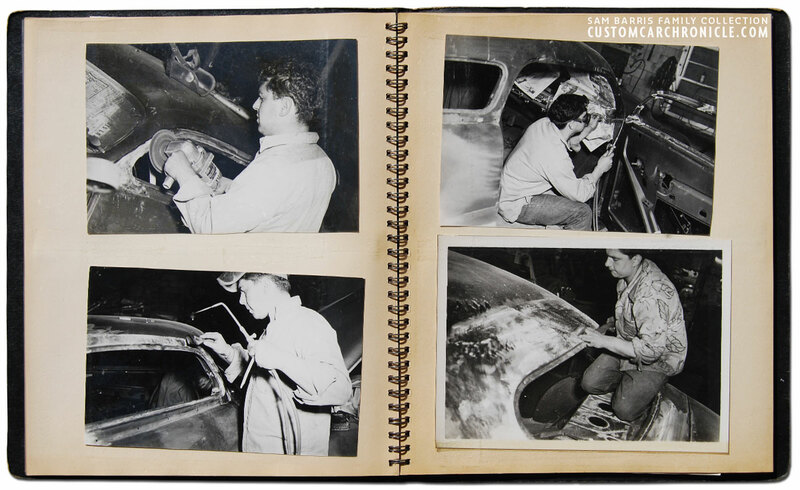 It was an photo album constructed by Custom Car photographer Marica Campbell containing photos she took of Sam Barris chopping a ’49 Mercury. 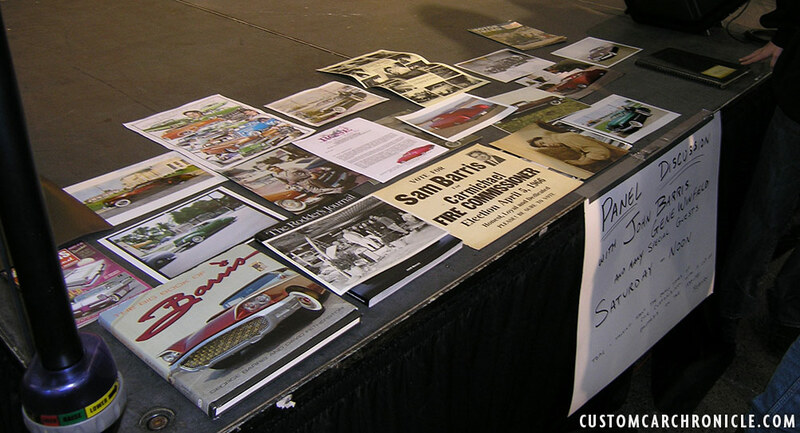 John Barris was invited to the Mercury Gathering at the 2009 Sacramento Autorama to talk about his father Sam Barris in a panel discussion. 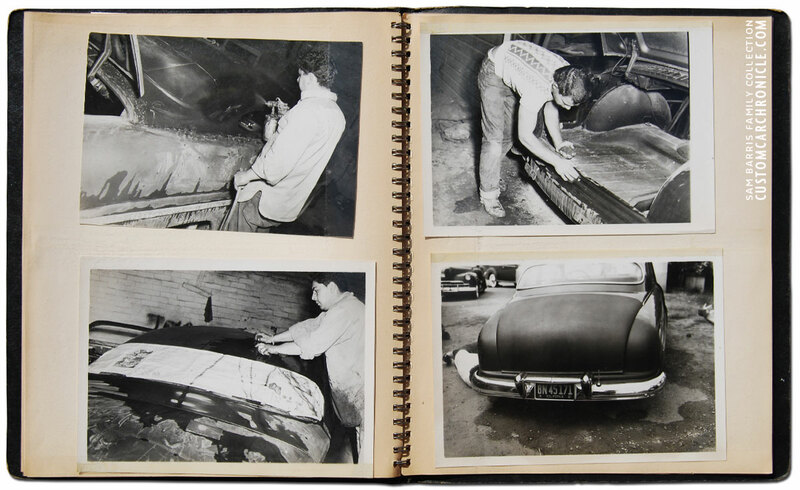 To visualize this John had taken some historic material from his father with him to show to the Custom Mercury enthusiasts, including the material was The Chop Series on 49 Mercury Work by Sam Barris Photo by Marcia Campbell photo album. Before I came across this unique photo album I was already in the clouds when I discovered the black and white poster created in memory of Sam Barris, another item John Barris had taken. 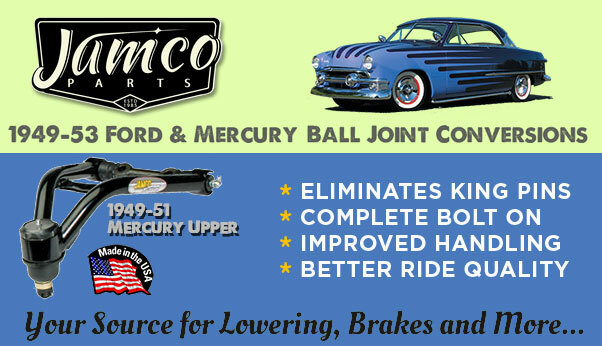 On this poster there were several new photos of Sam Barris chopping a ’49 Mercury. 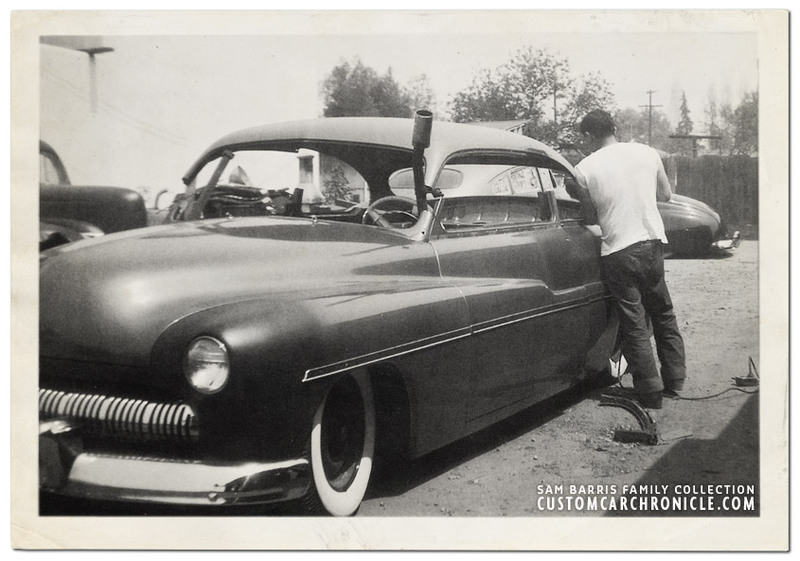 I quickly realized that some of the photos showed the Jerry Quesnel ’49 Mercury being chopped by Sam Barris. Wow… this was huge I though. A few moments later good friend Rob Radcliffe, who was looking with me at Johns material, urgently asked me to come and take a look at this album he had just opened. We both recognized Marcia Campbell’s name on the cover, and started smiling from ear to ear. 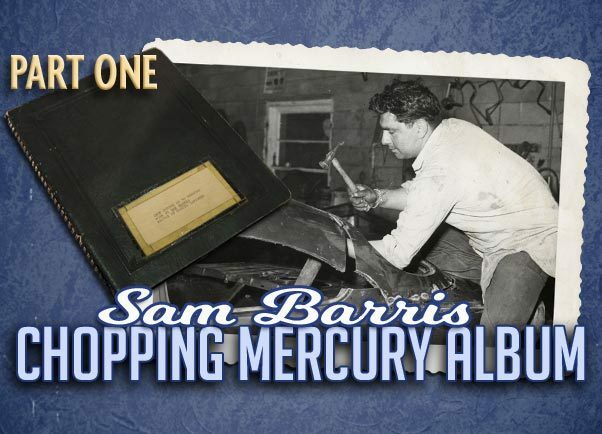 The way it was set up it was made to look like the album was about Sam Barris chopping his personal Mercury, with a colorized photo of Sam on top of the album. I had never heard about this photo-album and I was completely floored by its content. I imidiatley realized it was a sequence of photos taken by Marcia Campbell, already my hero, of Sam Barris chopping the Jerry Quesnel 49 Mercury. I then recognized some of the photos inside the album and realized that for a long time some of these photos of Sam Barris chopping a Mercury were wrongly labeled as Sam chopping his own personal car. I flipped thru the album, stared at the photos for a long time, and kept coming back to look at it again, and again. It was the absolute highpoint for me my trip to the Sacramento Autorama. Rob and I were discussing everything we had seen in the album, and realized how important this album was for the Custom Car history. The content of this photo-album not only solved some mystery about a filled antenna hole on the Mercury that had been listed as the Sam barris Mercury until then. 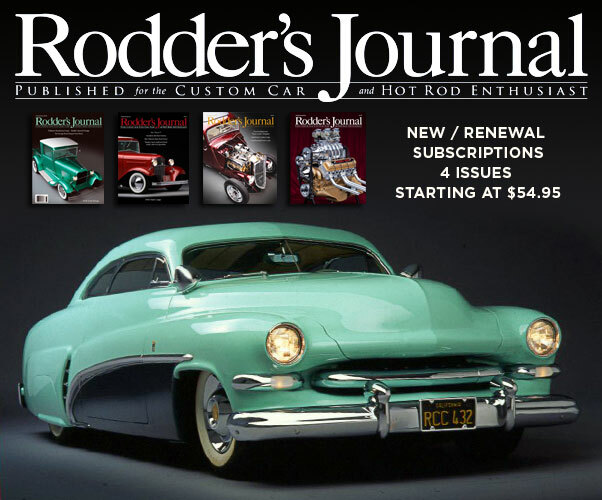 It also dated the first time Sam Barris was chopping a ’49 Mercury to 1951, instead of 1949. 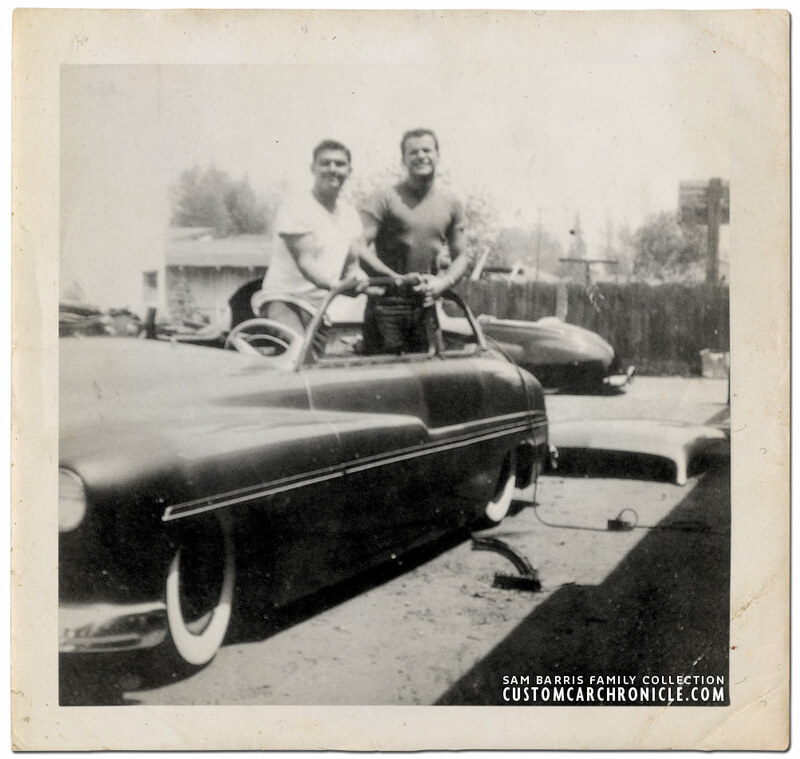 One of the photos shows Jerry’s unchopped Mercury with 1951 license plate tags on it… So far it a always been mentioned that Sam Baris had chopped his Personal Merc perhaps weeks after he had bought it new from the dealer. John Barris during the panel discussion showing one of the most famous photos of his father Sam Barris. Several of the photos from this series have been used in past Barris magazine and book articles. 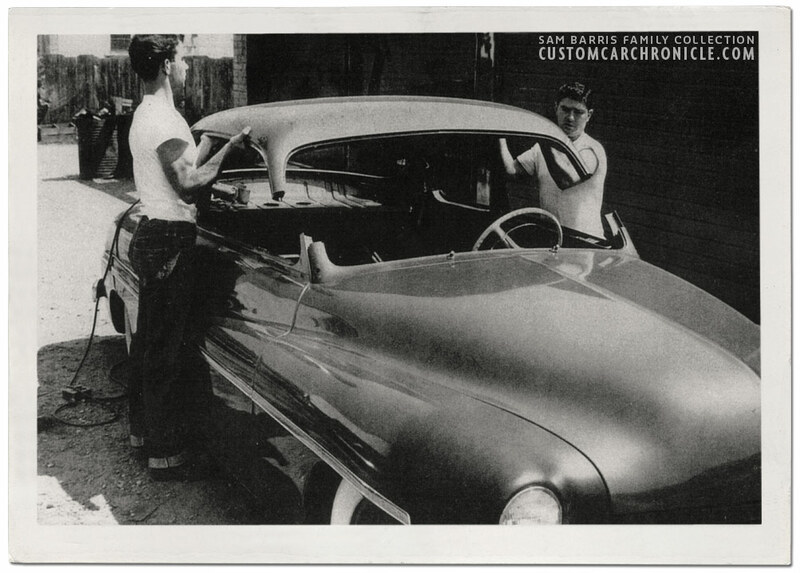 In all those cases the Mercury was described to be Sam Barris his personal ’49 Mercury. Some people knew about this Album that was part of the Sam Barris family collection and in the 1980’s the black and white poster was created with some of these photos. 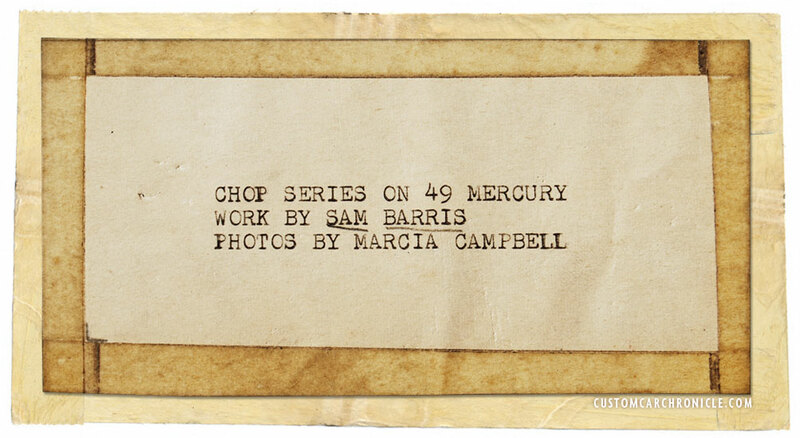 But so far these photos in this album was never publicly identified as the Jerry Quesnel Mercury being chopped by Sam Barris, instead of it being Sam’s personal Mercury. The first thing I noticed at the 2009 Sam Barris display was this black and white poster. It contained some amazing photos I had never seen before. Later I realized those photos must have come from the Marcia Campbell photo album. I later recreated this poster at full size and it can now be downloaded for FREE on the Rik Hoving Kustoms site. At the Sacramento show I also met with Curtis Leipold, a Custom Car enthusiast from Northern California who I have been in contact with on the HAMB. He mentioned to me that he had seen this photo album before, a few years back when he was working on a book project. He mentioned he had high-res scans of all the photos and would fill me in on some more info after we both would return home. Curtis was at the Sacrament show with his Westergard inspired 1940 Chevy coupe. After I got back home Curtis emailed me with the promised information about the photo-album. 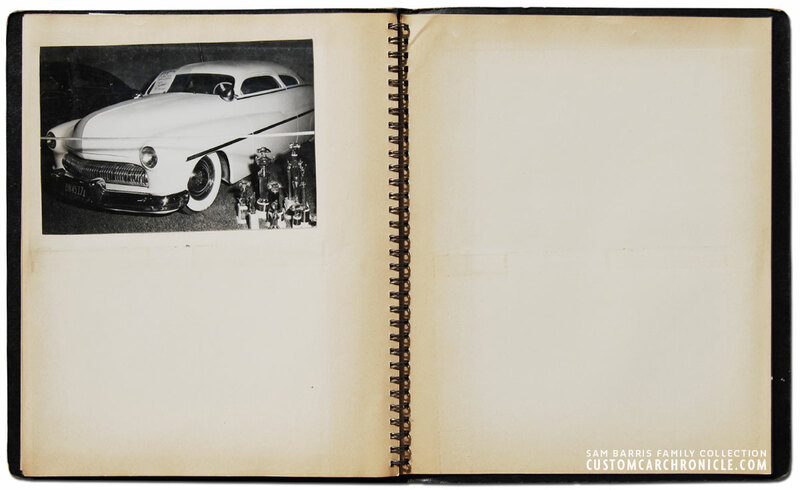 Around 2006-7 Curtis was doing research for an Custom Car exhibit and booklet, he contacted John Barris for some possible Custom Car historic material left from John’s father Sam. John handed Cleatus a box of material he had collected over the years. This is was Curtis had to say about it. When I came across all of it in the big tupperware bin John loaned us and I realized what it was, he completely freaked out! “What a great piece of history about the subject we love so much“. 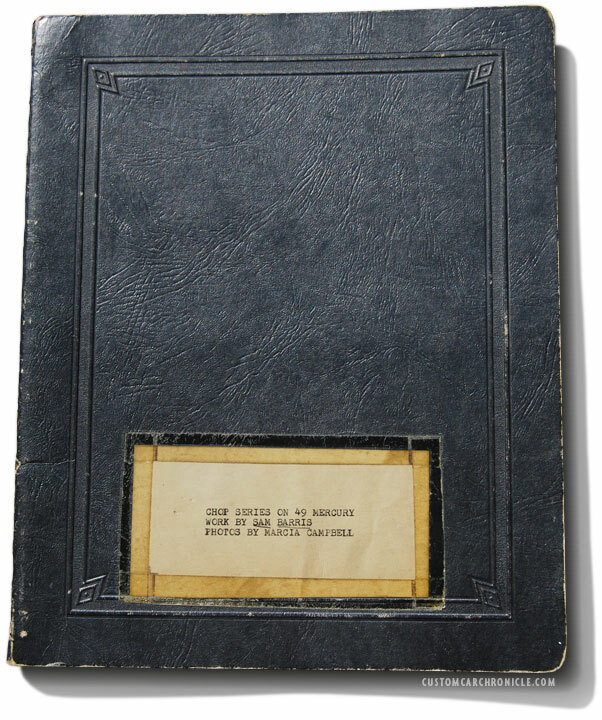 When Curtis found the empty album in the box of photos, it was inside an old, already been opened “dog eared” manilla envelope with a return address TO John Barris FROM (as as Curtis remembered it, but he could be wrong) Trendsetter – The newsletter for Kustom Kemps Of America – KKOA. So, his best guess was that at some point John Barris had loaned the album to Kustom Kemps of America – perhaps to do a retro article in Trendsetter some time in the distant past, or more likely that poster that John had at the Sacramento Show (in memorial to Sam). After they had used the material they then returned it to John with the photos possibly left loose in the envelope, and when John got it back he opened the envelope and added the content in with the rest of the stuff in the box. Perhaps this is how it came to be that the photos were separated from Marcia’s album. At the time the envelope looked fairly old, so I think it had been quite a while since it all took place. 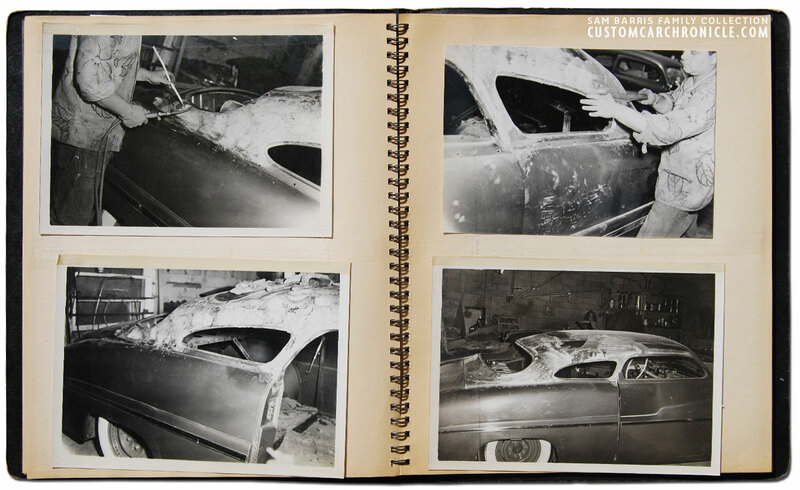 When Curtis investigated the content of the box he found that most of the material were flyers from recent George Barris involved car show, but he also found an old empty photo album, and a series of amazing photos of Sam Barris chopping an 49 Mercury. 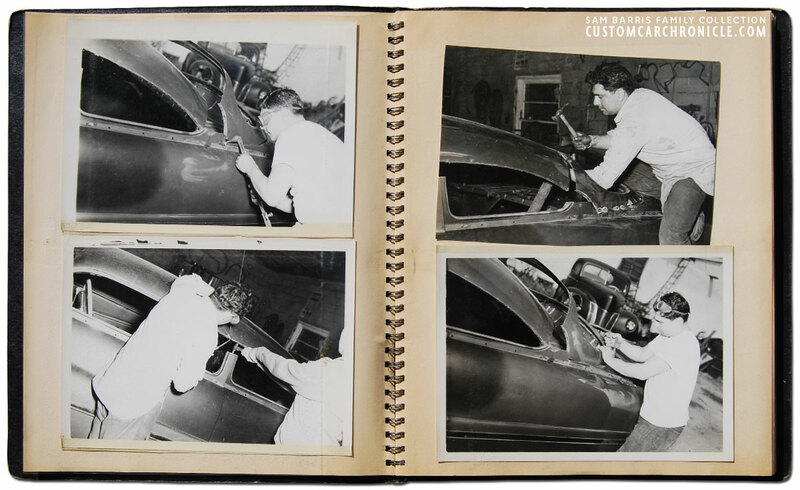 The photo album title said it all… Photos by Marcia Campbell of Sam Barris chopping his first 49 Mercury. 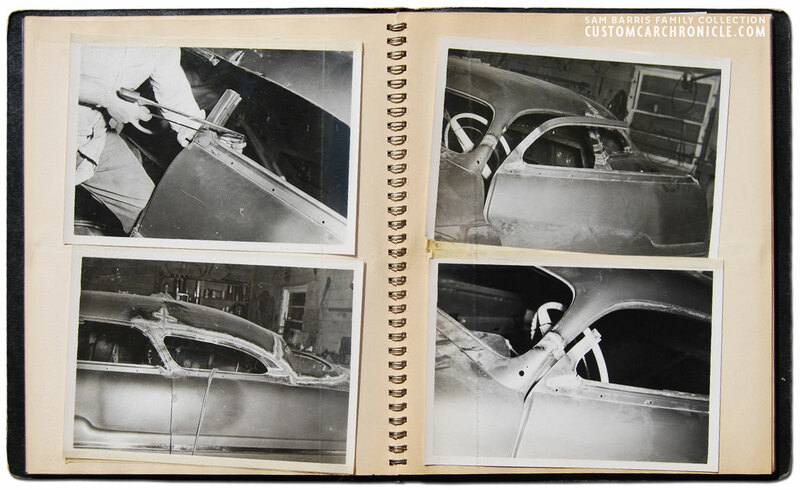 Curtis realized that this material was of big Custom Car Historic importance. He sorted the photos and placed them all back in the album to make sure the photos would not get harmed. When he later handed the box of material back to John Barris he mentioned his find and how important this material was. 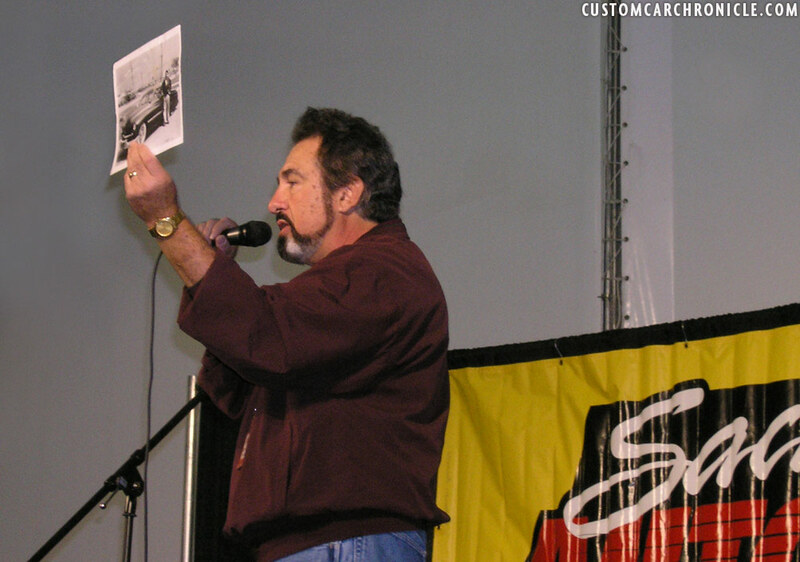 But sadly nothing was done with the material after that, until John took the album to the Sacramento Autorama in 2009. 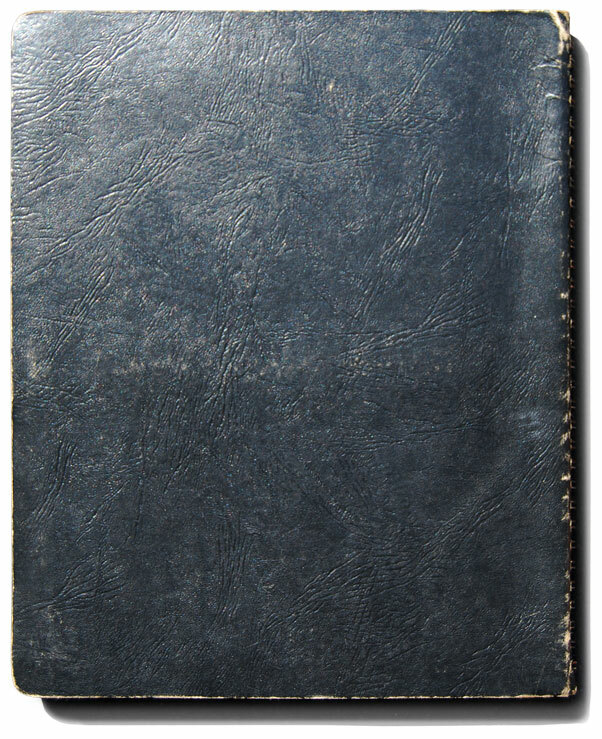 This unique photo album contained 35 photos taken by Marcia Campbell at the time when I saw it. More than likely some photos have been taken from it over the years, possibly to be used in the Barris Kustom Techniques of thee 50’s and the Big book of Barris, and were never returned after that to make the album complete again. 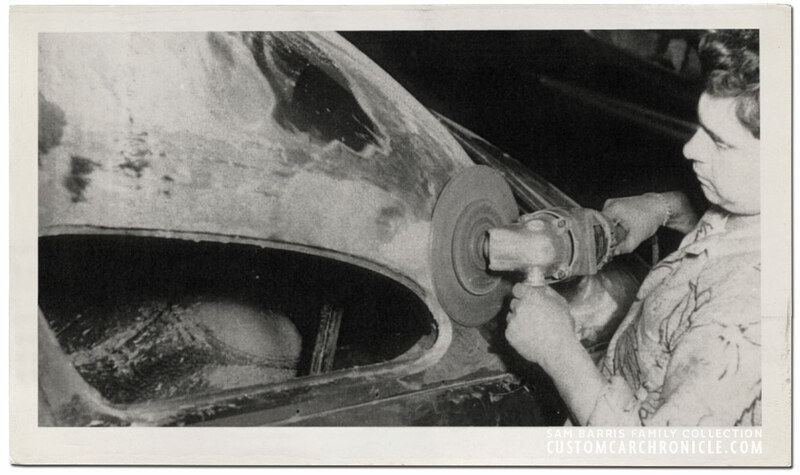 The subject of the Album, Sam Barris chopping one of the first – perhaps the first – 1949 Mercury’s. In the next article we will go more in depth about the photos and Sam Barris’s work. 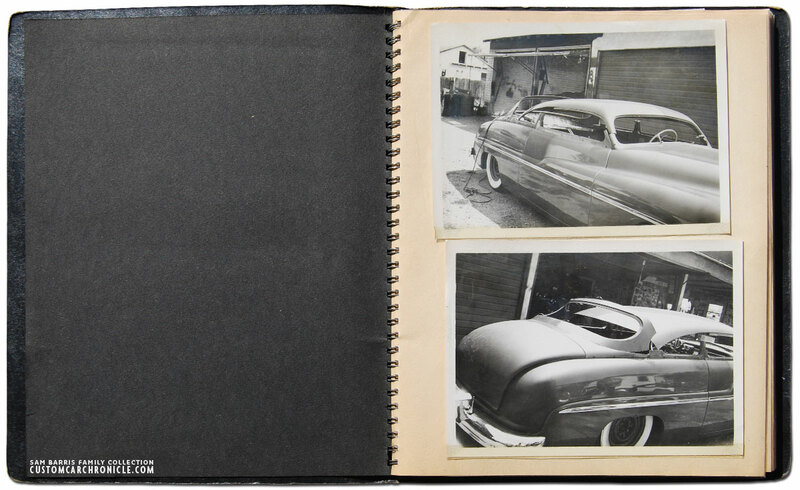 The photos of the album shown in this article were taken by me on November 2010 at the Barris Kustom Shop in North Hollywood. When I visited the Barris shop during the Jack Stewart Ford research trip I came across the ’49 Merc chop book and was able to take some good photos of it outside in the parking lot of the shop. The photos were far more superior than those I had taken at the Sacramento Autorama in 2009. Those I had to take indoors and lacked proper lighting. Sadly between the Sacramento time and when I saw the album again at the Barris Shop, somebody must have taken out the photos and placed them back in the wrong order. So the photos below show that some of the photos are not in order. I will get back to that in the next CCC-Article on this subject. I noticed that 25 of the photos included in the album have a white border around them, the other 10 do not. I know that Marcia most of the time developed here own film, and most likely did the same thing for the photos in this album. Possibly Marcia made more than one set of photos, some with and some without the white borders. Possibly one set for this album, and one set for George his personal files, and over the years they were swapped back and forth and a mismatching set ended up in the album… but this is pure speculative. It could also be possible that the photos with the borders show the complete photo, while those with no border are enlarged on the same size photo paper. Just to remove some extra background and focus more on the subject. 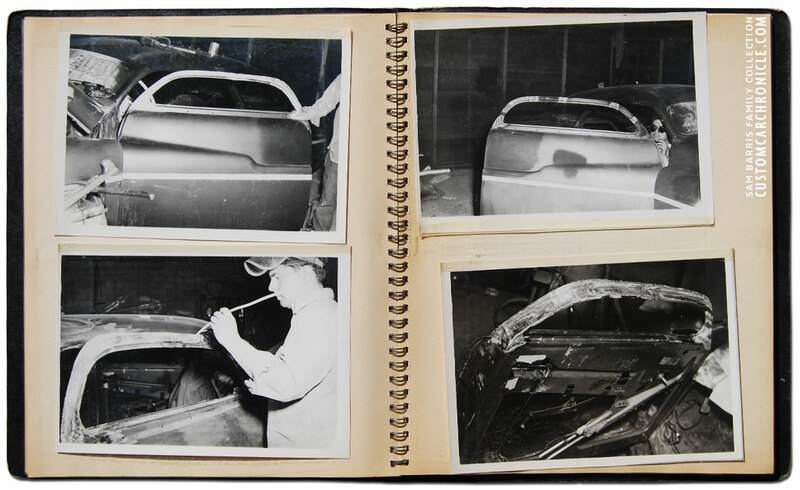 The photo of on the bottom right shows Jerry’s Mercury with the trunk and rear fenders in primer, but still with the uncut top. This photo should have been all the way at the front of the album. 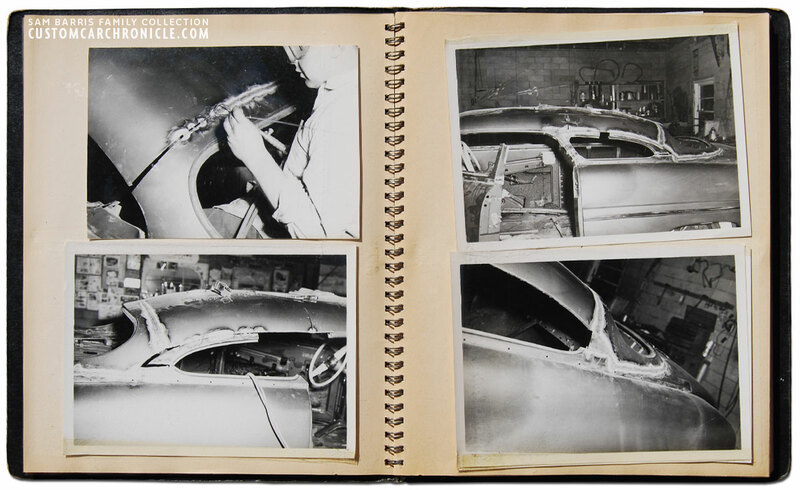 The last spread of the album shows Jerry’s Mercury in white primer at the Montebello Tent show, most likely in 1951. 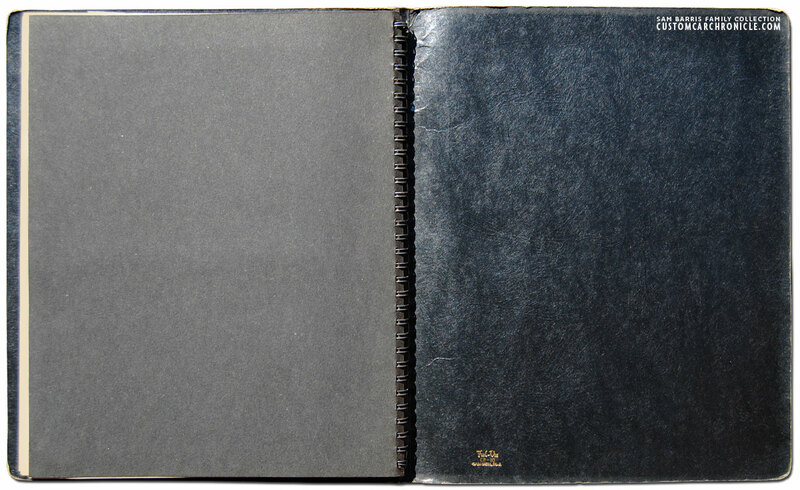 This photo also shows that there use to be three more photos on this page, and I believe the discoloring was also present on the back of the right page. But sadly I did not take a photo of that to proof it. When I saw the photo album it contained 35 photos. But at the end of the album the yellowed pages showed that at one point there had been more photo in the album than the 35 in it now. at least 3, but more likely 5, perhaps even more of the photos look to be missing from it. 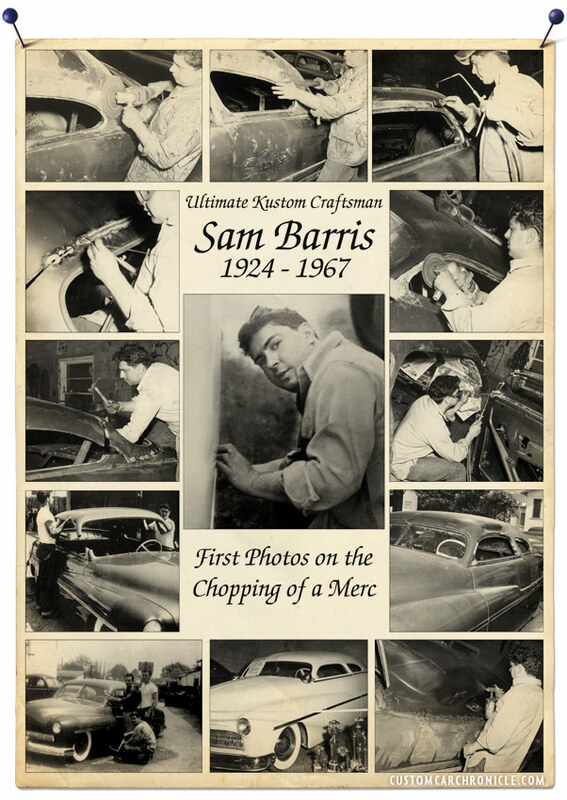 In several of the Barris Kustoms produced books photos have been used of Sam Barris chopping a ’49 Mercury. And most of these photos look to be part of the Marcia Campbell range of photos. 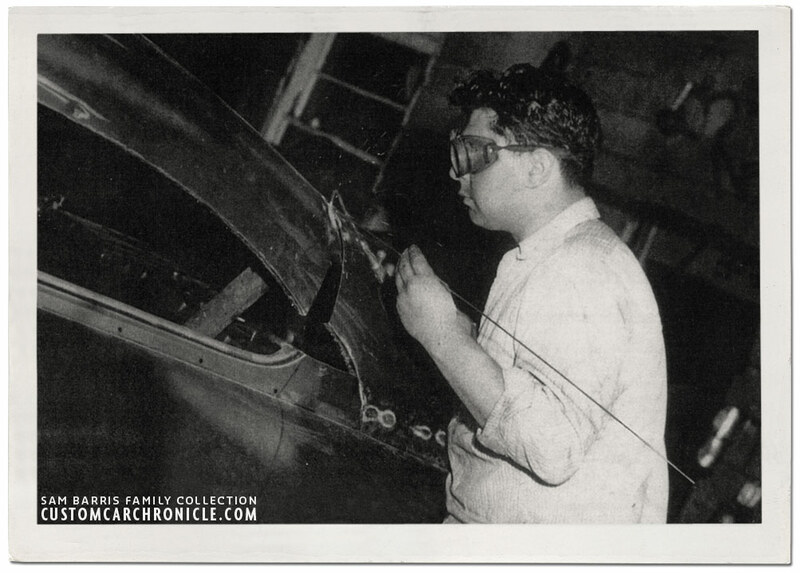 The very first photo taken in this series of photos is this one where George Barris pretends to make the first cut (with the glass still in place), kneeling in front it Sam Barris, who would later do the real work, and car owner Jerry Quesnel with the white shirt. It is as if they knew they were doing something important (chopping their first 49 Mercury) and decided to capture this moment. This photo shows Johnny Zaro helping out Sam Barris, it is the only one in the set that appears to have been taken with a different size film, and is also more fuzzy than the rest. Possibly this one was taken by somebody else. 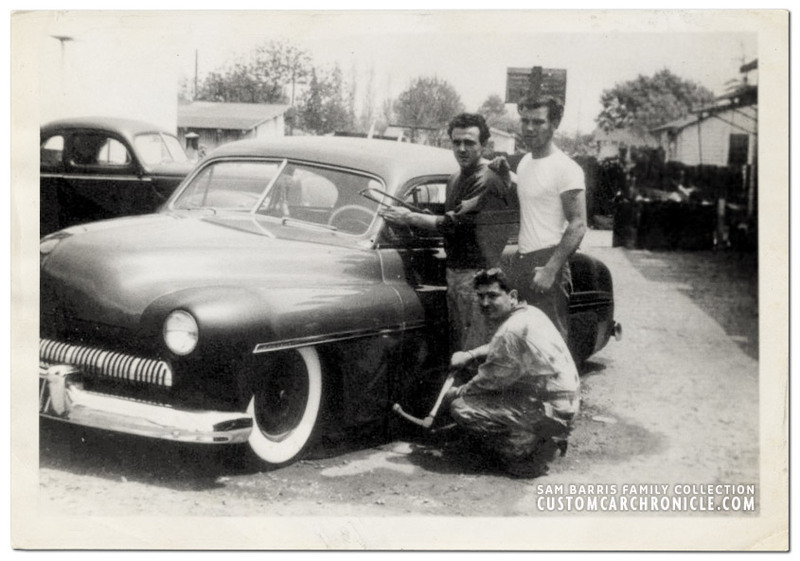 In PART 2 on the Marcia Campbell photo album of Sam Barris chopping Jerry Quesnel’s 1949 Mercury we will take a closer look at the photos in this album. Priceless! Marcia knew history was being made. What a debt we owe to her. How fortunate we are to be able to study these images on the CCC. I love seeing these historic pictures……..
Hacksaws and gas welders. Reminds of the way that I was taught. Thanks Rik for helping me get thru a really boring winter. Rik, you have a real knack for bringing us real history lesson type stories and presenting them in the most interesting way. Thank you. ..and thanks Marcia wherever you are!! Thank you Dave… I love doing these type of article. That was such an incredible event filled with some great conversations with John Barris. Thanks for bringing these great memories back to life and sharing it with others, Rik…a weekend that won’t be forgotten! It sure was Rob, fantastic weekend, my first time in California. What a trip. Seems like yesterday! I have contacted John Barris via email and Facebook a few times with no luck. He was a high school history teacher close to retirement when we met him back then and I was still in college headed into teaching. It would be great to reconnect with him somehow. Aside from that, I can only imagine what other treasures he has from his father. I know Brad Masterson still visits Sam’s widow. This was a great weekend and this album was the highlight probably just as much as having a car in that show. It’s like this was meant to be to prove some of the false labels we have been reading about for years. Jerry had always mentioned the stories about his car getting chopped and how it was the guinea pig and when this album was brought that weekend it just validated a whole lot of Custom history. I know there some people at that show that weren’t very happy to find out this wasn’t Sam’s car but at least it was Sam chopping this merc. These photos are pure custom heaven as far as I’m concerned. I did hours of research and hours of talking with Jerry to come to the conclusion that the pic of his Merc in white was at that Montebello show among some of the top customs of socal at that time. I wish Marcia was around to thank her and talk to her about these times. I also really like how some of the pics look like they have been worked to make sure the license plates can’t be seen, those are the ones we see in the technique books. Plenty of other stuff that shows what merc it really was getting that FIRST CHOP. i was not there, but i remember the impact of that album on us ! finally the proof on whose merc was chopped first, and when ! crazy ! As ever, thanks for sharing those wonderfull article with us .